March 8—Three Willcox High School students are advancing to the International Science and Engineering Fair as a result of being named grand prize winners in this year’s Youth Engineering and Science Fair (ISEF), held in Sierra Vista, March 6-8. This year’s fair, sponsored by Sulphur Springs Valley Electric Cooperative (SSVEC), drew approximately 270 projects created by students grades five through 12 from throughout southeast Arizona. 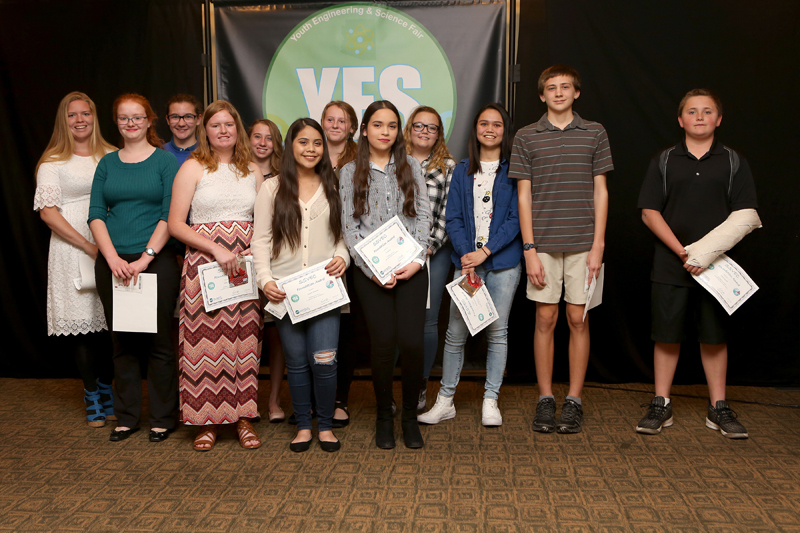 Prize winners were announced and presented with their awards in a special ceremony on Thursday evening, March 8 at 7:00 p.m. at the Windemere Hotel in Sierra Vista. A team project by Dakota Finley and Eduardo Lauro of Willcox High School titled “Plasphalt” was one of the grand prize projects. The second grand prize project by Ashley Riggs of Willcox High School was titled “Satellites and Cows.” These students and their teachers/advisers earned all-expense-paid trips to the ISEF competition in Pittsburgh, Pa., in May. First place projects in the 9-12 grade division were Elisabeth Casey of Veritas Christian Community School for her project titled “Talk, Talk, Splat,” Thor Gavin of Veritas Christian Community School for his project titled “Bring in the Heat,” and Kristi Webster of Willcox High School for her project “Red Planet Plants.” Each of these projects earned a cash award of $500. The grand prize winner in the 7- 8 grade division was Joseph Wallace from First Baptist Christian Academy for his project “Electrolyte Trials.” A team project by Isabella Hollin and Jennalyn Jardeleza, students at Colonel Smith Middle School, Fort Huachuca, AZ, took the grand prize for the 5-6 grade division with their project titled “Got Bars?” Each project earned a cash prize of $500. assigned to a category of physical science, biological science, technology, energy and engineering or earth and space science. First place projects in each category of the 7-8 grade division received $300; first place projects in each category of the 5-6 grade division received $200. Prizes were also awarded to second place, third place and honorable mention projects in each of the five categories. Cash awards were presented for the winning projects; in the case of team projects the award amount are divided among the team members. Projects in the 9-12 division wee based on one of the 17 categories defined by the International Science and Engineering Fair. Judges selected three first place, three second place, three third place and three honorable mention projects. Second place, third place and honorable mention projects in each of these three categories won cash prizes ranging from $250 to $100. The advisers of students whose projects received award recognition at all grade levels also earned cash awards. Special awards were contributed by several companies and organizations including Arizona G&T Cooperatives, The Huachucans of Sierra Vista, United States Air Force, Office of Naval Research, NASA – National Aeronautics and Space Administration, and Intel. Marcus Harston, YES Fair Coordinator, expressed appreciation for the efforts of SSVEC staff and volunteers as well as the 59 volunteer judges who made this year’s fair (the 35th YES Fair) a success.